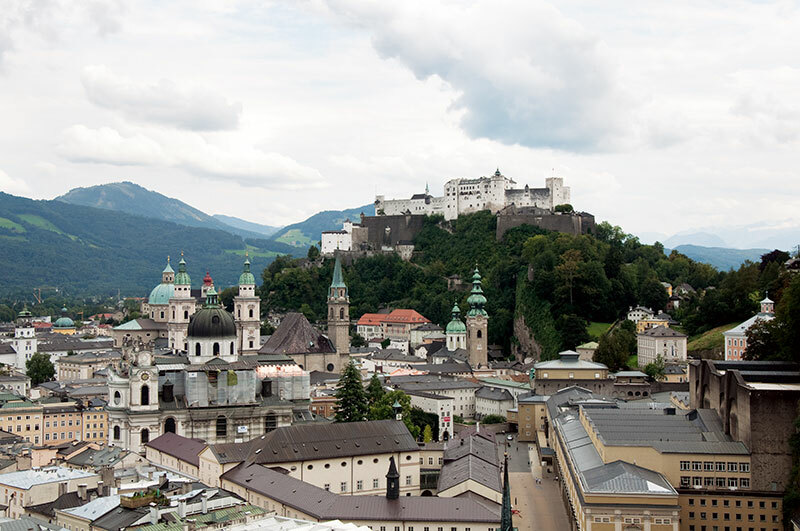 We are almost on the edge of the Alps feasting our eyes on a Baroque jewel called SALZBURG. 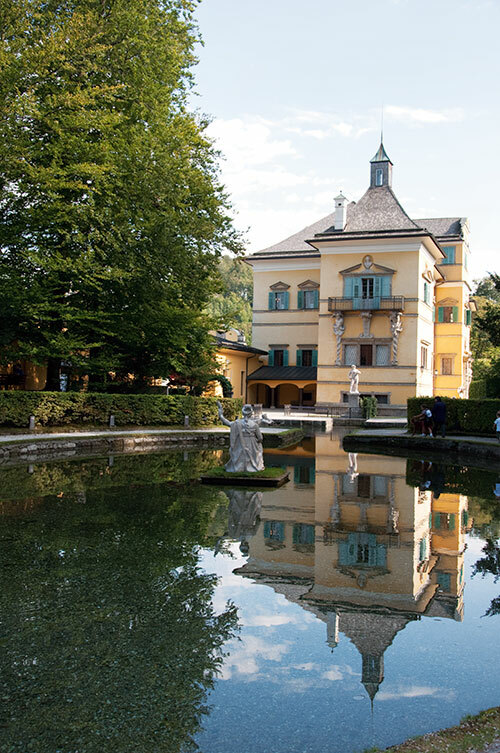 Nestled between two mountains, Mozart’s birthplace is picture postcard country: fortress on a hill, blue skies, glistening river, pastel-hued houses…. Come winter, the town, draped with a mantle of snow, acquires a blinding sheen, with carols, church bells and candles suffusing the rooftops with a warm glow. In fact, on our stroll through Getreidegasse (the main shopping street), we come across at least three largely X’mas-specific shops, overflowing with Nativity thingummies. 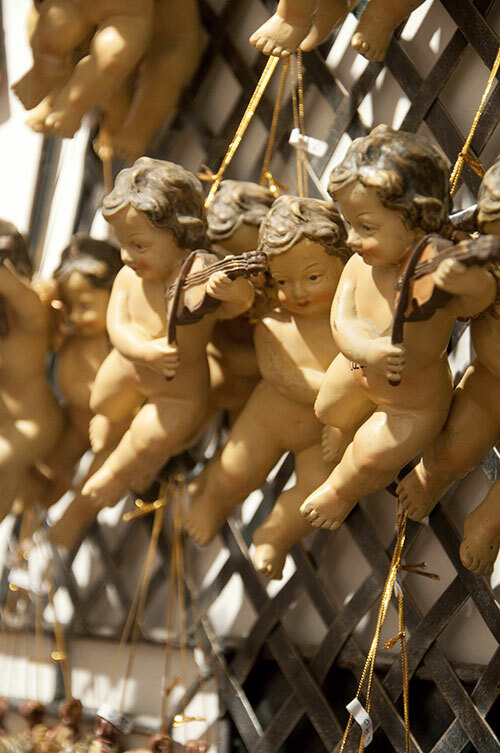 My personal buy: a sheer gold wire-threaded, handcrafted angel. The street is a historic delight. Most of the little shops, though now bearing name plaques at their entrances, have preserved their original decorated signages, indicating the type of goods that can be found inside. These were meant for the not-so-learned who could easily locate a hat shop or a wine bar just by looking for the appropriate visual rendering outside a door. 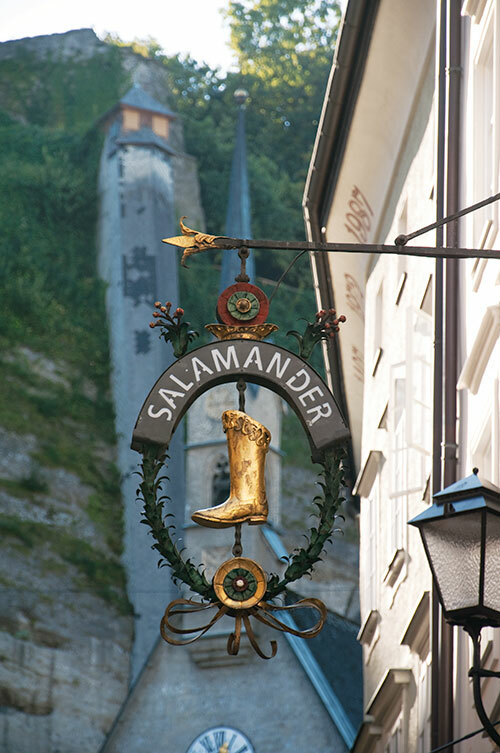 Gathering our shawls around us, we join the high heeled and the black tied in a brief funicular ride to the Hohensalzburg Fortress, the city’s proud landmark and the largest preserved citadel in Central Europe. Our tickets for Festungskonzert – a live performance of light chamber music – seat us in the second row. It is a surreal experience. A medieval castle, cold stone floors, imposing columns, musicians at play. If it were not for my neighbours sheathed in Lycra stockings and trendy black dresses, I could almost hear the swish of 18th century silk and a horse’s hooves below the bay window! 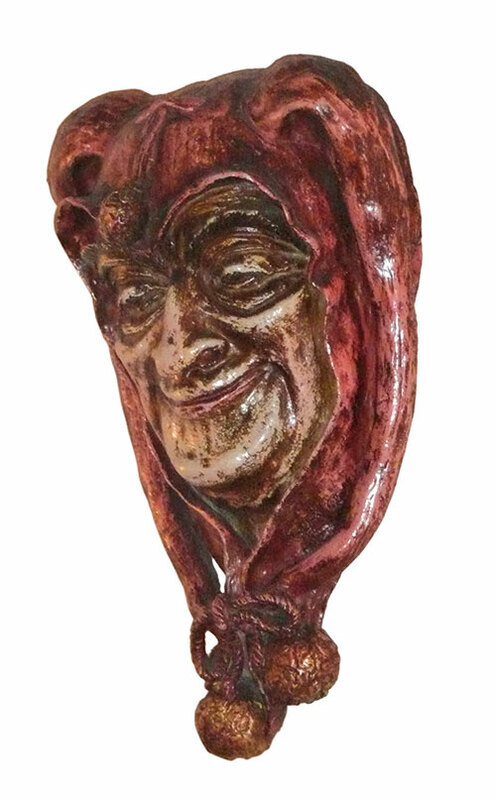 Dinner is at Zum Eulenspiegel, so named after a clown-like young man with a multicoloured cap – popular muse for poems and opera – who spread wisdom and goodwill throughout his wanderings in the guise of pranks and lightness of spirit. In the 15th century, the vertical structure which houses the restaurant, first belonged to a belt-maker, then a veil-maker, followed by a rope-maker, before it passed through a string of new owners. In 1950, the 500-year-old private home was remodelled into a restaurant of unique style with intimate dining areas and charming views. Our host for the evening, Gunda Bleckmann (she already knows the Indian translation of her name!) is dressed in the authentic Austrian costume and as we order thick breasts of chicken with sinful roast potatoes, our waiter, very obviously Indian, cannot control his excitement at being able to spout his culinary knowledge in Hindi! 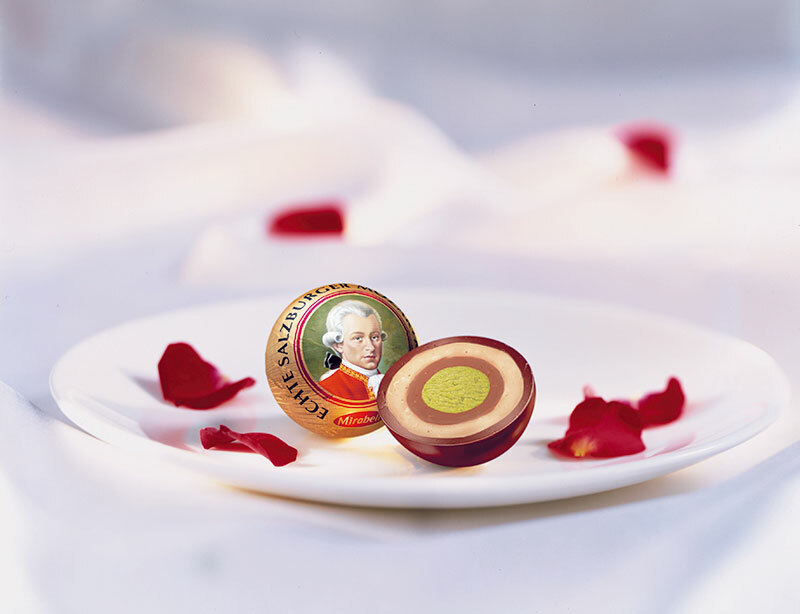 On our many strolls, we discover that Wolfgang Amadeus Mozart, son of Salzburg, still lives – on fridge magnets, chocolate wrappers, T-shirts, pill boxes, coffee mugs, even baby blankets! The house where he was born has few visitors this morning so we are able to acquaint ourselves with his life and music in a leisurely manner instead of being jostled by crowds. The violin he played as a child, family portraits, old letters…including a peek into the middle-class lifestyle of the revered composer who died at the age of 35. 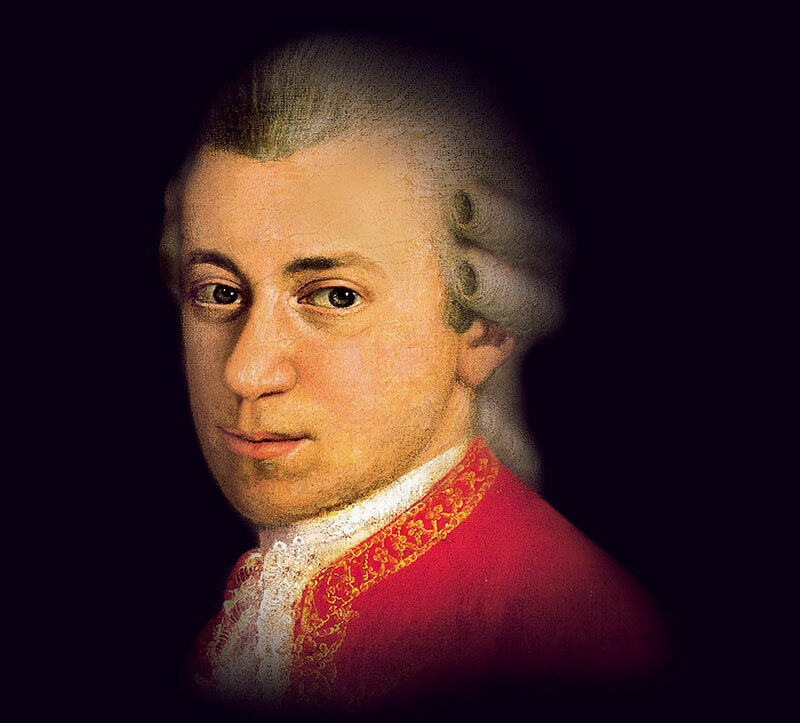 Mozart, of course, lives best through his compositions, and it was in the little Viennese summer house, later transported to Salzburg’s present-day Morzarteum gardens that he is said to have completed The Magic Flute. We are in luck. The opera is being staged that very night at the Marionetten Theater and Gunda assures us of a last-minute entry. But before that we have to keep a date with Mozart expert and Salzburg historian Horst Reischenbock whom we follow to the outskirts of town to the summer palace of Hellbrunn. Masterminded by the wealthy Archbishop Markus Sittikus, the palace and its lush environs were created for the single purpose of enjoyment. The child-like Archbishop took great pleasure in entertaining dignitaries and clergy in the grottos and gardens by surprising his guests with sudden jets of water. These would spring out from the most unlikely spots like from under their chairs when they were polishing off their strudel! Four hundred years later, the trick fountains do themselves proud and there is much delighted shrieking when our touring group, consisting of a gaggle of kids, keeps getting water ambushed at the most unexpected moment. They look at Horst in awe (and not just because he’s about six feet five) who, throughout our hour-long sojourn in this Baroque Disneyland never has to flick off a drop. That’s because he probably has the locations committed to memory, comments my colleague drily, shaking out her hair. Later at the opera, we almost forget that we are watching puppets, not people. 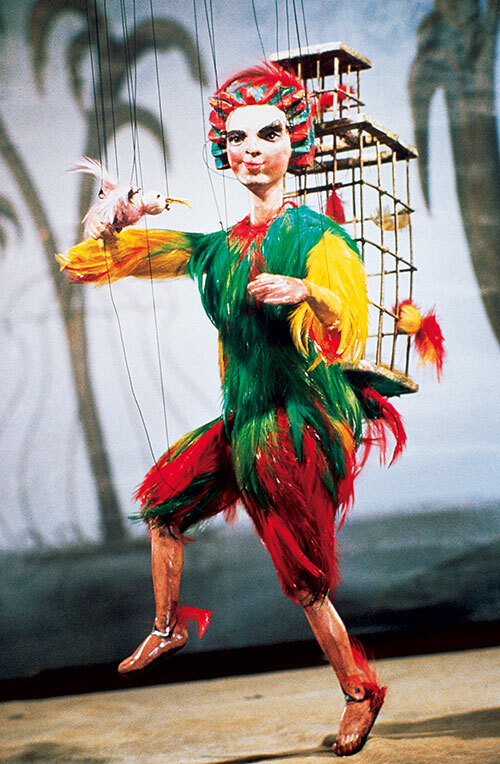 The marionettes are life-size, beautifully costumed and develop lives of their own. The nuances of the language and music may whizz past our heads but the simple story of an abducted princess, an evil Queen of the Night, a loyal friend who talks too much and a young prince with a magic flute is universal and easy to follow. Also because the company’s present adaptation, specially produced for the US, emphasises the magical fairy-tale element rather than the grandeur of pure opera. A light rain catches us unawares when we step outside so we make a run for the hotel, a few minutes away. It’s been a long day on the feet and at Hotel Sacher, the bed is at its most inviting. For more reasons than the obvious. Here, you sleep on cambric-encased down feathers and the pillow has been treated with anti-ageing Vitamin E! 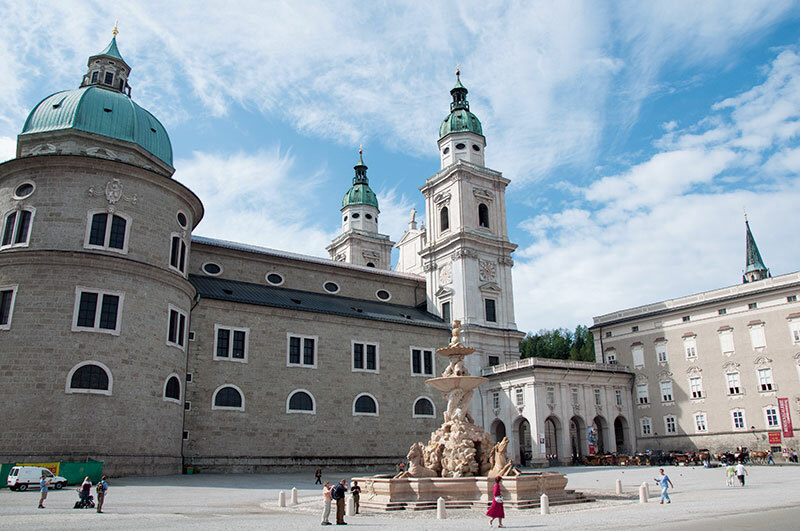 For all those who sang along with Julie Andrews in Robert Wise’s Oscar-winning The Sound of Music, we will have you know that more than 40 years after its release, the tour to the movie’s outdoor locations in Salzburg are a huge tourist attraction much to the amusement of its inhabitants who saw the film only about a decade ago and remain unimpressed. 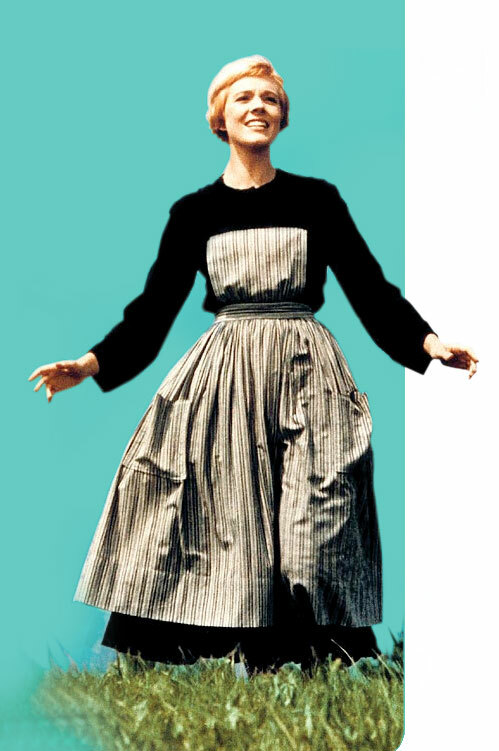 After all, this was a Hollywood production glamourising in its inimitable style the real Maria Von Trapp’s story. We travel in a time warp in the comfortable cocoon of a Panorama Tour bus with the incorrigible Peter Nussbaumer who embellishes the behind-the-scenes-of-the-movie anecdotes with humour and song. 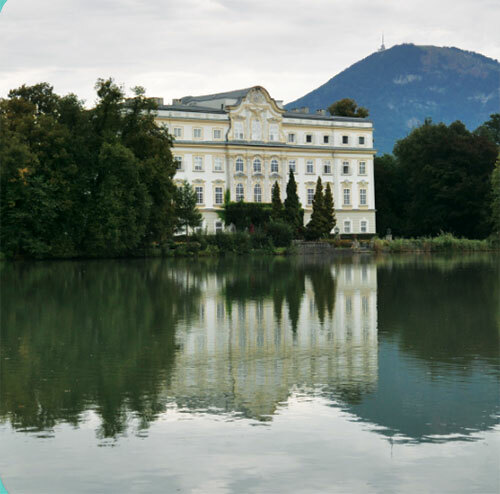 The ochre-fronted Frohnburg Palace was the Trapp Villa facade, the lake-washed Leopoldskron Palace, its rear, where Maria and the Captain danced on the balcony. St Peter’s Cemetery is where the family hid behind the tombstones and Hohenwerfen Castle, the picturesque backdrop for the iconic Do-re-mi. 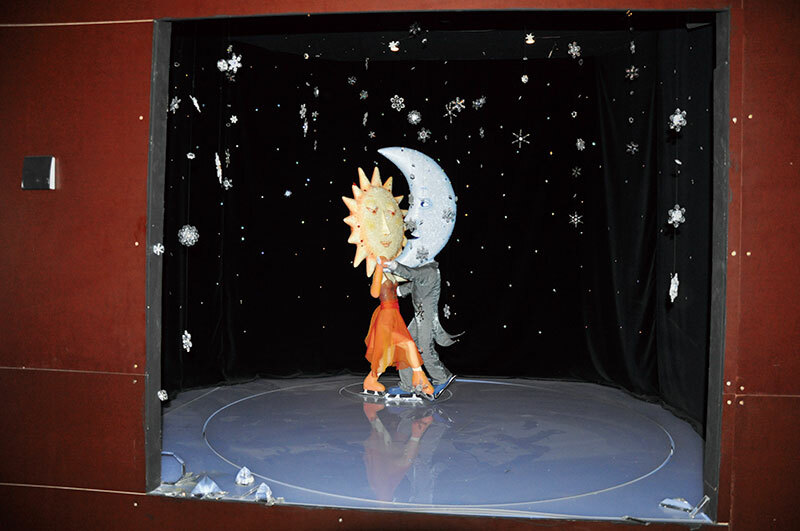 It was at the Pegasus Fountain in Mirabell Gardens that Maria and her brood marched around the magnificent winged horse and at the former rock riding school where they swayed to Edelweiss. At Mondsee, a charming village off Salzburg, we pose for pictures before the glass gazebo where Rolf serenaded Leisl and pause at the Baroque altars of the Basilika Mondsee where Maria and Captain Von Trapp got married. Our group is in agreement that a seventh viewing of the movie is overdue! Elisabeth Grassmayr’s car refuses to start. We offer (unhelpful, I think) suggestions from our snug seats, she speed dials her husband (whose car it is), fiddles furiously with the ignition, but the little vehicle remains stubbornly immobile. A small group gathers around her window nodding their concern: the concierge from the hotel across, a passing friend walking his dog, a former work colleague, the neighbouring shop attendant. And once they give the car the big push, we splutter forth towards lush meadows and sentinel-like mountains with Elisabeth waving her thanks. 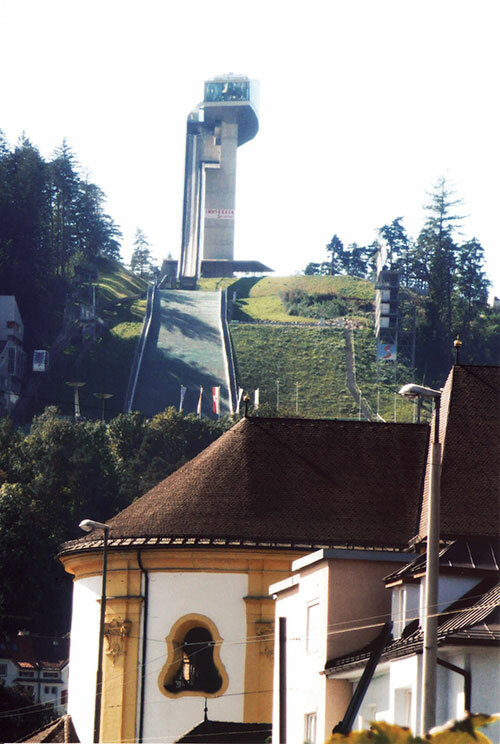 Almost everyone living in INNSBRUCK is acquainted with the feisty 72-year-old. Her family has lived here in the valley for 300 years, her husband’s for 400. Their ancestral homes are within walking distance from each other. 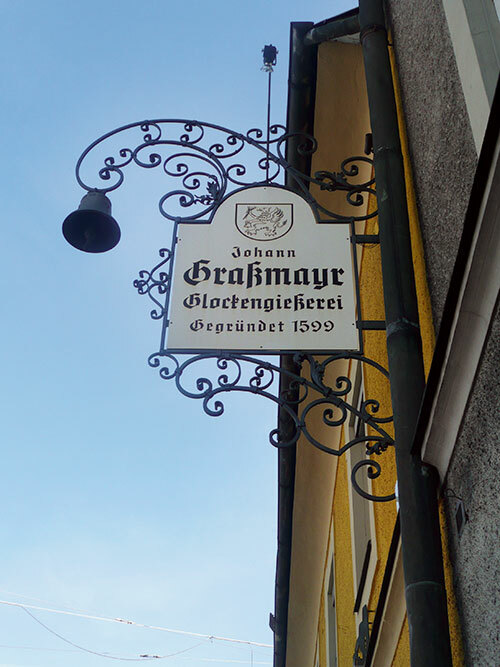 And since 1599, the Grassmayr family has cast bells for the world. 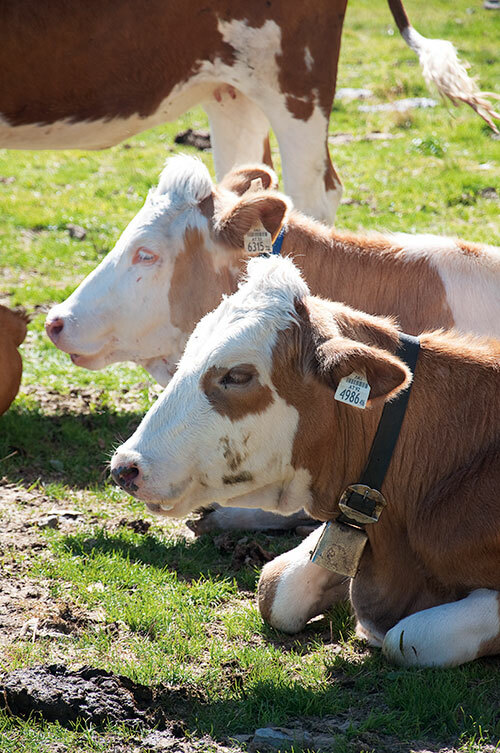 Elisabeth leads us into the foundry where bells rule – in all sizes. 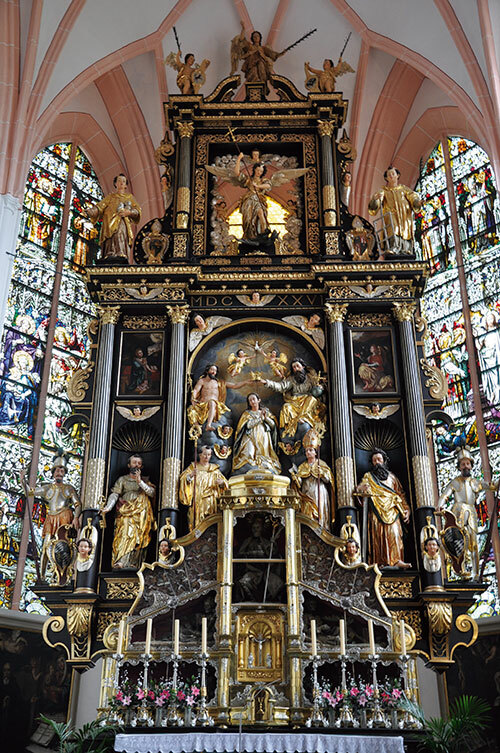 Enormous ones that are being crafted for churches all over Europe, U-shaped cow bells that find their way onto Swiss pastures, ornamented tinkling ones, custom-made for a baptism…. Grassmayr bells peal in more than 100 countries – the oldest bell still ringing (in Italy) was cast in 1636. An acoustical adventure beckons and fascinated, we ‘pound’ a mammoth bell, measuring the time it takes for the tones to slowly fade away. On the way out, Elisabeth gifts our group a brass piglet each from the store above the foundry, ‘for good luck’. Innsbruck is small and beautiful. It is golfing, trekking and skiing country for the seriously active but for the likes of us, we are content to explore the old town on foot and the mountain top by cable car. From the precincts of its guardian mountain, the Hafelekar, you can look down into Germany from the north and Italy to the south. We squint for the camera on the sun deck of the town’s latest flaunt, the 47-m-high Bergisel Ski Jump, brainchild of the maverick London-based Iraqi architect Zaha Hadid who reinvented the 1925-erected structure with an Olympic past into the futuristic ski feat platform of today. Women are not allowed to show off their skills here, for safety reasons (In my personal estimation, if they flew off the ramp, they would probably crush their entire reproductive system!). 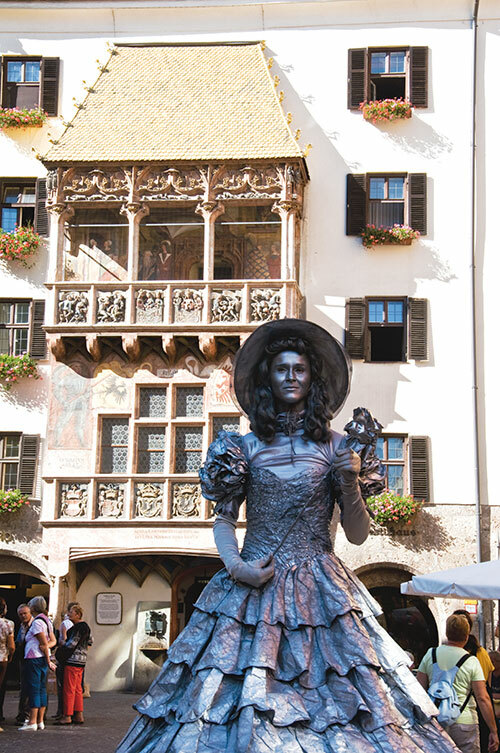 Leaving the funicular for the narrow car-free streets of the charming Old Town, we step in and out of quaint boutiques, snack bars and art galleries to pause before Innsbruck’s famed ‘Golden Roof’. Built in honour of the then ruler Maximilian I’s second marriage to Bianca Sforza of Milan, the 16th century loggia covered with 2657 gold-plated shingles, glints in the late afternoon sun almost as much as the girl in the shiny metallic dress who is standing still on an elevated platform. Elisabeth, of course, recognises her. She is a student and her friend’s granddaughter. We rush to put some Euros in her plate and she performs a delicate dance, while quietly mouthing ‘Thank you’, to Elisabeth. Lunch is tandoori roti and butter chicken (believe me) at the town’s Indian eatery Madhuban where we catch up with Nicholas Boekdrukker, the dapper international representative of Innsbruck Tourism. He wants to know how our morning went and is slightly bewildered when we tell him that the story of the day is Elisabeth losing her Dior sunglasses between an ascent and a descent and us retracing our steps and not finding them! We meet Nick again later for a noodles and shrimps dinner at the buzzing Thai-Li-Ba before he puts us into the capable hands and solid SUV of Martin Gundolf. All of Martin’s family are performers. They yodel, they do the polka, they play the harp. They act. 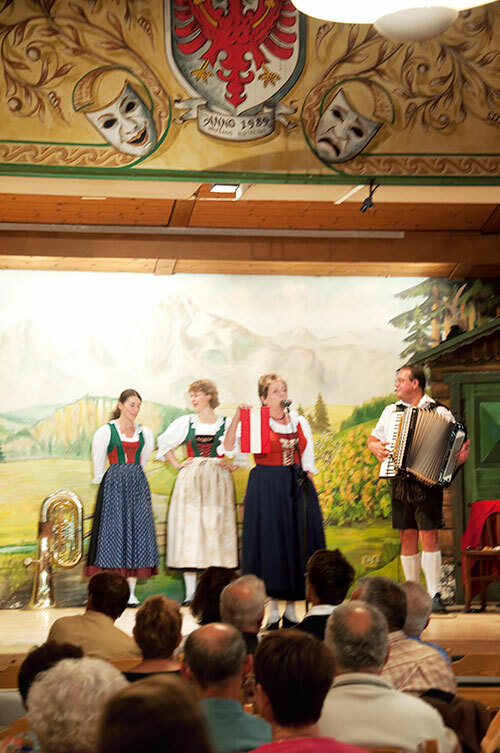 The family Gundolf has been organising special Tyrolean evenings since 1967, keeping alive popular Austrian folklore and music traditions dating to the 19th century. At the end of a very robust performance, which saw us through many flutes of bubbly, the performers on stage twirled to a medley that encompassed the nationalities in the audience that night. For us, they valiantly burst forth with Sare jahan se achha! Prepare to be dazzled at Swarovski’s Crystal World, creation of multimedia artist Andre Heller, a 30-minute bus ride from Innsbruck. Inside the water-spouting, sparkling-eyed green giant that greets you at the entrance are 14 chambers of wonder that dare you to dream. Paintings, sculptures and artworks seduce you into a sensual journey of mystery and magic through a glittering labyrinth. By the time you reach the ice passage you are literally seeing stars! Pass through Jim Whiting’s mechanical theatre that reflects a desire for change, fashion designer, the late Alexander McQueen’s fragile crystal tree crafted along with light artist Tord Boontje and the fantasy world of Austrian stage designer Susanne Schmogner where plants devour crystals and the sun waltzes with the moon. Shekhar Kapur too, with architect David Adjaye, has created a moving pictures installation called Sankalpa where two art forms merge and integrate viewers into the happenings. But the piece de resistance has to be the crystal dome where you stand transfixed inside a gigantic crystal while a thousand beams of refracted light bounce around the facetted walls. A much coveted spot, we learn, for a destination wedding! Ah, the ‘Blue Danube’. Less blue than I imagined, more straight than sinuous, it even has a swimming pool in the middle! Still, it is the river that has been romanced by history and Hollywood. 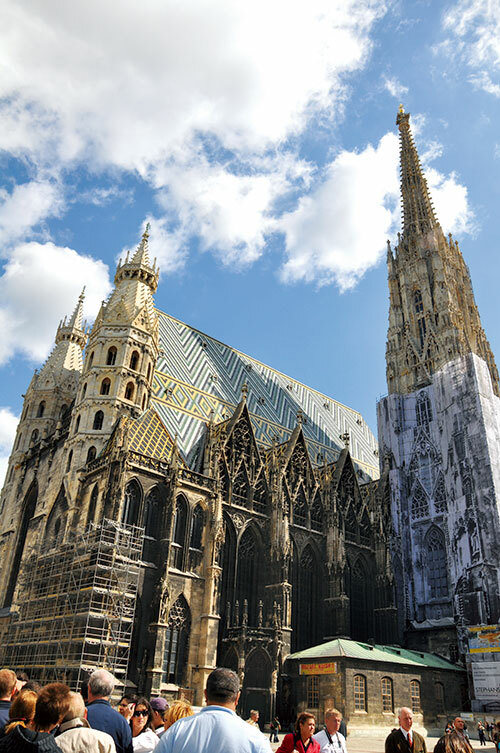 We are in VIENNA, capital of Austria, erstwhile empire of the Habsburg dynasty, city of Mozart, Beethoven and Strauss, home of the Vienna Philharmonic Orchestra. The walk along the Ringstrasse is invigorating, the park with the gilded figure of Johann Strauss, a relaxing detour and the edifices, a bit of a discovery. Iconic monuments bravely coexist with modern marvels. The 32-storey Hochhaus Neue Donau, the tallest residential building in the city and the T-Mobile headquarters that resemble a reclining skyscraper speak much for the city’s architectural innovations. 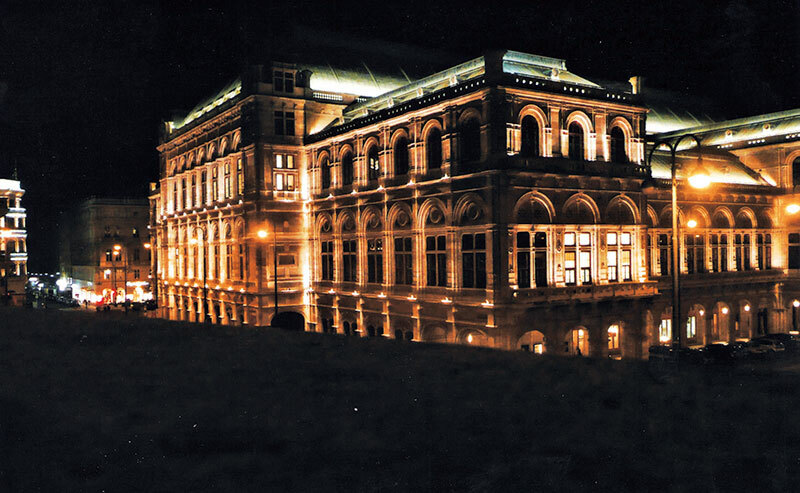 As for the famed Vienna Opera House, the story goes that when it was first ‘unveiled’ in 1869, the inhabitants of Vienna declared that it looked like a railway station! But Belvedere Palace, summer residence of Prince Eugene of Savoy, remains one of the finest examples of Baroque wizardry. Artist Gustav Klimt’s The Kiss, an old favourite, hangs in the Austrian gallery on the upper floor and I decide I must splurge on a print. 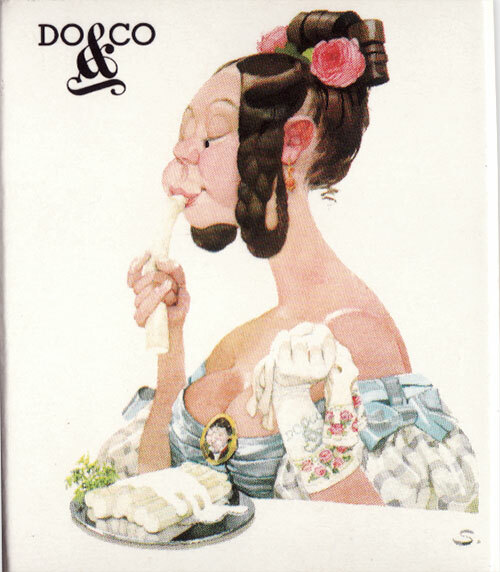 Steirereck im Stadtpark, one of Vienna’s most sophisticated eateries is where we settle for dinner, chatting amiably with the chic manageress Birgit Reitbauer. Her husband is the owner-chef and the meal is unadulterated gourmet theatre. Following a lip smacking ‘starter’, we begin with organic farm-grown Viennese figs with marinated ‘sun gold’ tomatoes, germinated cress seeds and lightly grilled Carinthia perch. When the bread basket arrives we get so dazzled by the selection that we decide to concentrate on the wine. A warm potato salad with cold smoked Alpine-salmon and poached foie gras is followed by a slow-cooked catfish with its accompaniments of braised shallots and baby kohlrabi.The dessert is a platter of wild strawberries soaked in elderflower juice, chicory hearts dunked in sour wine crystals, yoghurt ice cream and meringue. We are not finished yet. Ever-smiling staff wheel their wares from table to table – the cheese board (125 varieties), the tea trolley where fresh leaves of the chosen flavour are picked off the plant and brewed to perfection, the chocolate trays with overhead mirrors so you can indicate your favourite….The decor is all velvet drapes and Murano chandeliers and even the washroom is worth a visit for its funky interior. 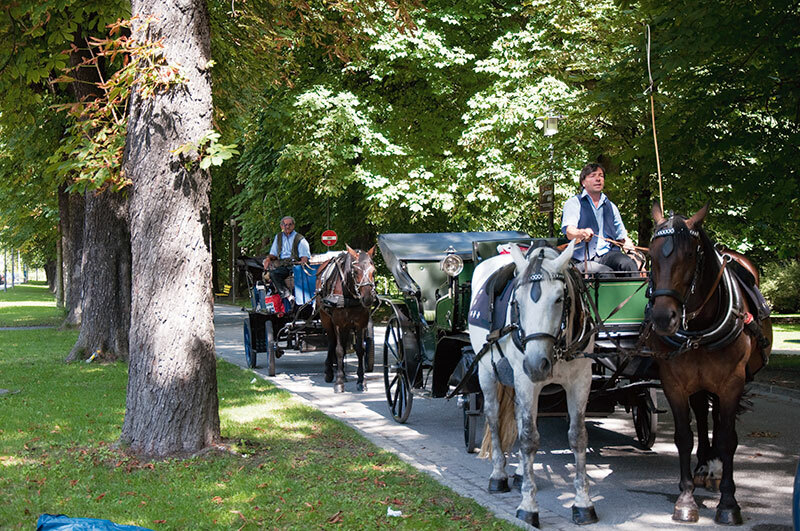 In the morning we trot obediently behind Diane Naar, our truly wonderful guide who in the course of our stay, regales us with stories, anecdotes and observations about Vienna and the Viennese from a perspective that is both local and from the outside. She came here as a student from Britain and never returned. 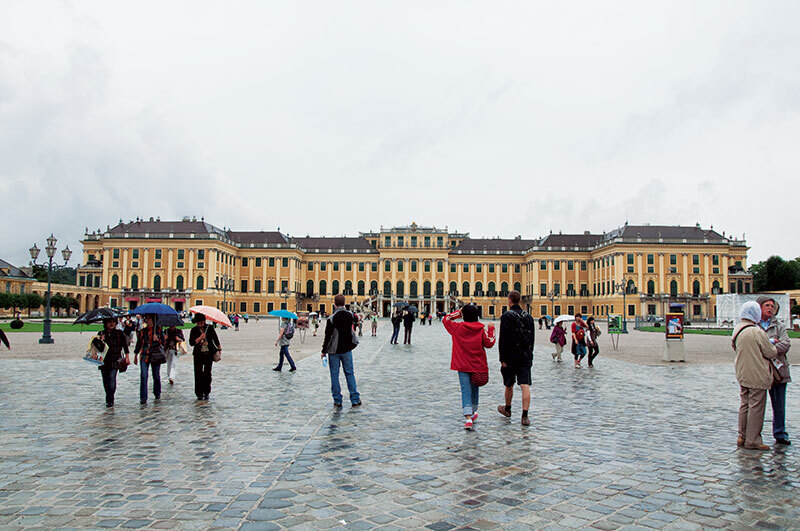 Married to an Austrian, Diane now knows her history backwards and at the 1400-plus roomed Schloss Schonbrunn, while we glide through brocade-encrusted halls, gilt-edged chambers, the blue staircase, the yellow salon, her little nuggets about royalty and its ways keep us enthralled. 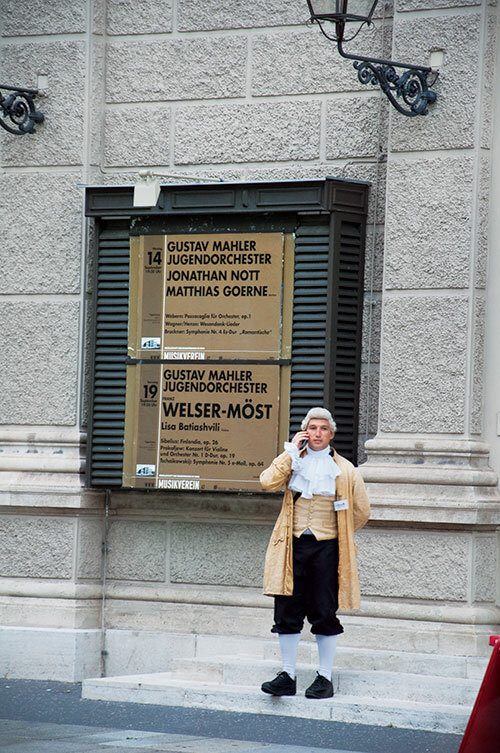 The now World Heritage Site is where seven-year-old Mozart performed and from where Archduchess Maria Theresa, the only female Habsburg ruler, gave an impetus to the proliferating arts and culture of the time. At a basement cooking class on the historic premises we watch how the traditional apple strudel takes shape, from the extended layer of dough – transparent enough to read printed matter through it – to the final golden-brown slice that emerges from the oven and is ladled onto our waiting plates. The buttered breadcrumbs are well, gently crumbly, the cinnamon and raisins, in complete tandem, the sour apples, firmly tart and the shot of rum, an explosion of warmth. Armed with printed instructions of ingredients and method, I feel we are finally being let onto a state secret in a land where recipes are guarded so fiercely! The opulence of Schonbrunn grows on us so we linger on for lunch at its hugely popular Residenz Cafe, before hitting the chocolate trail. 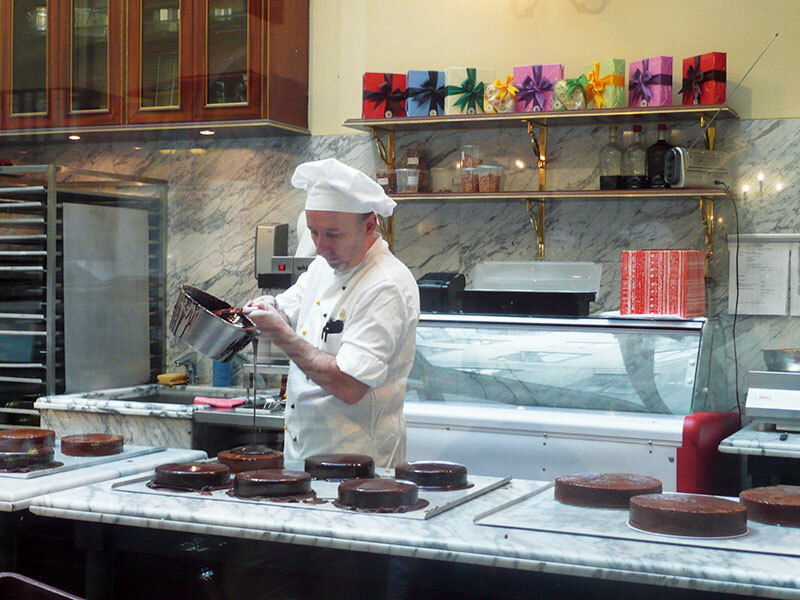 Handmade Austrian chocolates are to be wooed with patience, for everywhere we go, there are queues to contend with. The to-be-preserved wrappings and packaging are unique to each store and the brand. Some even resemble doll’s house furniture: little chests of drawers and mini cupboards, overflowing with the gooey bonbons. 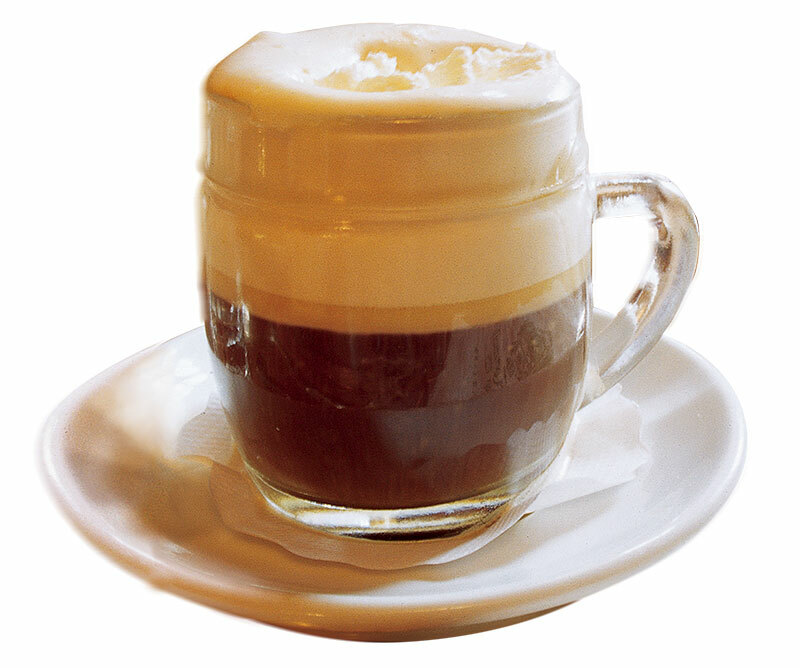 Demel’s Sohne are the most well known out of the country and at the counter, we hear a customer requesting for an early shipment to Germany. 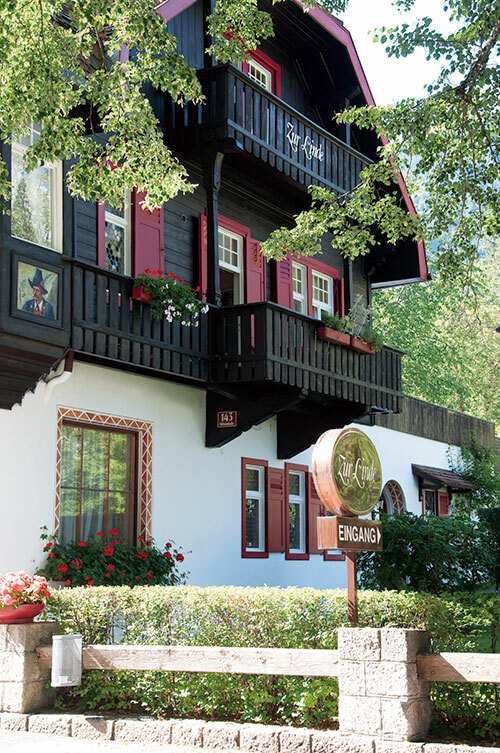 Continuing our hedonistic pursuits, we soon bundle ourselves into a waiting cab and head for the 100-year-old Wieninger winery where the sprightly Fritz Wieninger awaits us with bottles of his best. The vineyards are cultivated according to bio-dynamical principles, based on the strengthening of the soil with natural resources that include insects, animals and other plants. Then, drinkers, he explains, get a residue-free wine which comes from healthy grapes. We proceed to happily swirl in our mouths Wieninger bestsellers, a Gruner Veltliner (white) and Wiener Trilogie (red) among several others before we ready ourselves for a typical Austrian meal of meat and potatoes at the restaurant. A traditional NuBberg Alte Reben arrives with compliments from the host. Time runs out as it is wont to, for this is our last day in Vienna and Diane decides that we must explore the very trendy Museums Quartiers, or MQ, a cultural cluster of boutiques, art shops, galleries, cafés, housed in former riding stables. The enormous courtyards are home to performing arts, literary readings, children’s activities and the like. This is where we pounce upon our true designer finds, blue pumps with extraordinary heels at the avant-garde Shu and an arty T-shirt from Advanced Minority. 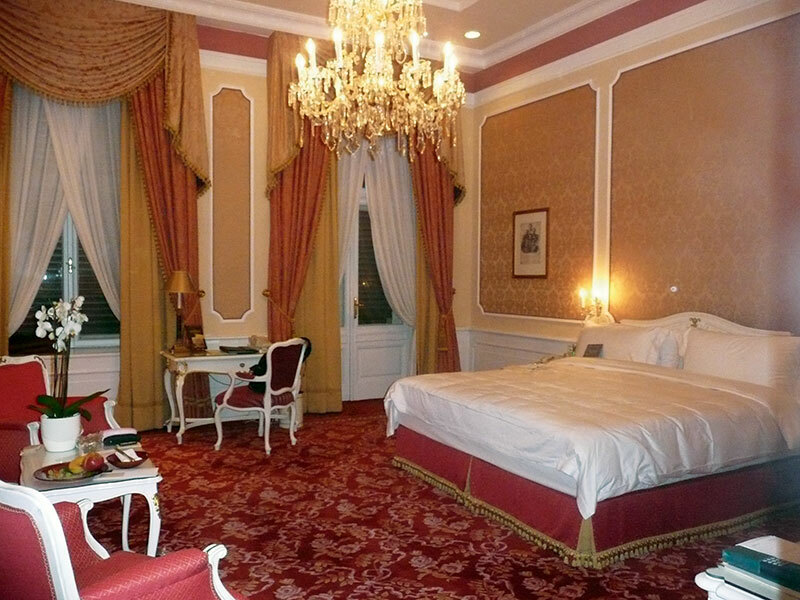 If it’s Vienna, Hotel Imperial is where you should wake up. I am in a room with a view – inside! The space is so vast that I can host a private ball here. Opulent brocade-style carpet, chandelier lighting, a writing desk so elegant in its curves that it belongs in a collector’s home and a bed that can accommodate a family of four. No surprises here that Heads of State and world elite have partaken of the hotel’s sumptuous surroundings which include walls covered with jewel-toned silk and generously proportioned bathrooms carved of marble. Former residence of a German duke, the 19th century hotel that reeks of old-world splendour in its neo-Renaissance furnishings, gilt mirrors and grandfather clocks boasts a 24-hour butler service, a hand-ironed newspaper with the morning tea and an imperious tasting of the Imperial Torte. Adolf Hitler worked here as a day labourer in his youth, doffing his hat to all those who went in! 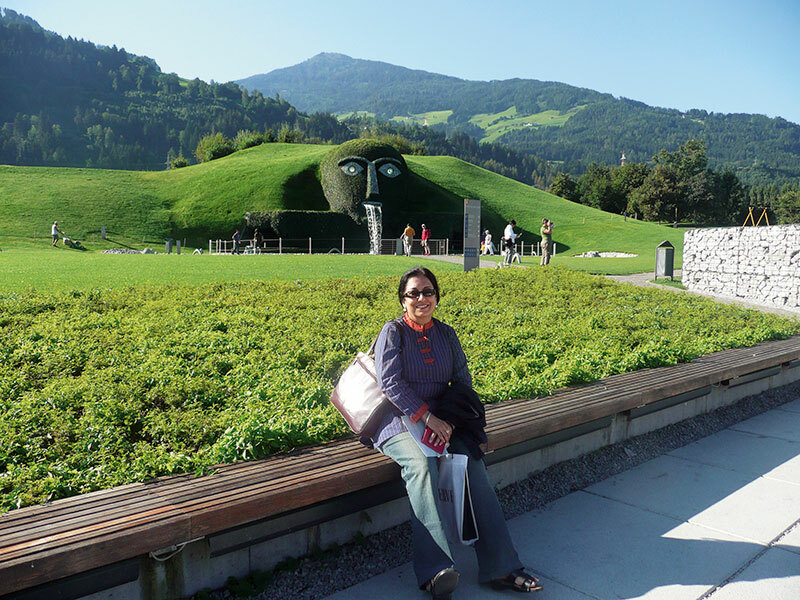 FLY to Vienna by Turkish Airlines from Mumbai via Istanbul or by Austrian Airlines from Delhi. Speedy trains connect the capital city with Innsbruck and Salzburg. 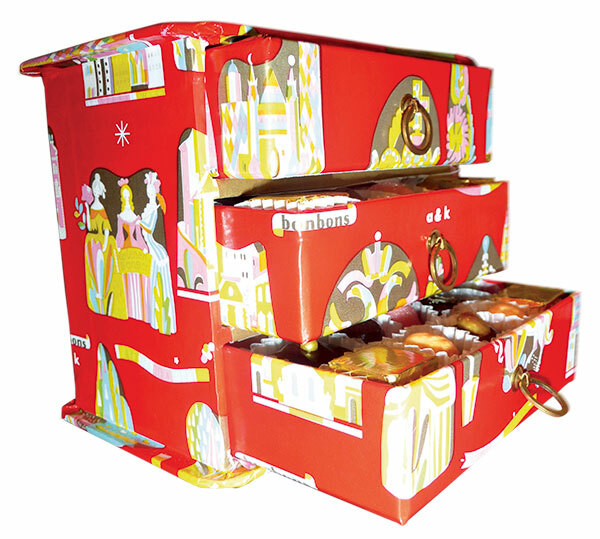 BUY Staud’s jams, professionally packed Sacher-Torte, handmade chocolates, honey-infused soaps. LISTEN to at least one classical concert in a castle. STUDY your surroundings. Discover a piece of art around every corner. WATCH the lively Lipizzaners, Europe’s oldest horse breed, toss their manes and prance delicately in time to classical symphonies at the Spanish Riding School. INDULGE in a moment of mindful shopping at the 300-year-old Dorotheum, for vintage Omegas, rare paintings, even limited edition pendants in mother-of-pearl. GORGE on mustard-drenched Viennese hot dogs on the way to Naschmarkt and savour the intense aroma of an espresso at one of the many coffee houses.